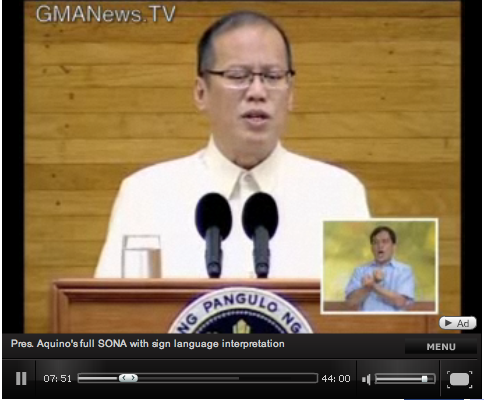 Browse > Home / Announcements, National News / PNoy’s SONA Reaches Thousands of Deaf Pinoys Nationwide! PNoy’s SONA Reaches Thousands of Deaf Pinoys Nationwide! NCDA lauds GMA7 for its a history making a streaming news on President Benigno “Noynoy” Aquino’s State of the Nation Address (SONA) with sign language interpretation, last June 26, 2010. The Council cheered with thousands of deaf viewers this country’s first ever SONA, heard live by thousands of deaf citizens through a sign language interpreter, thanks to GMA7’s kapuso network. Excited MCCID Training Director and PWAG President Remberto â€œJojoâ€ Esposa Jr. tipped off the Council day before the Presidentâ€™s SONA, that GMA7 News tapped him to interpret the event, most awaited by every Filipino here and in many parts of the world. For the first time, deaf Pinoys, felt one with fellow Filipinos with and without disabilities everywhere in the world, the same great pride over the new Presidentâ€™s humble but noble pronouncements. Loud and clear through the interpreter, they too applauded his marching orders to ban undue use of â€œwang wangsâ€ (sirens) and his call to fight corruption in his inaugural speech. Most of all, his â€œKayo ang Boss koâ€ (You, the Filipino people, are my Boss), got the biggest public cheer of all. P-noy's SONA with sign language inset. Mr. Esposa, is a member of the NCDA SubCommittee on ICT and President of the Philippine Web Accessibility Group (PWAG), an online advocacy group created by NCDA from its workshop series on Web Accessibilty, in 2005. 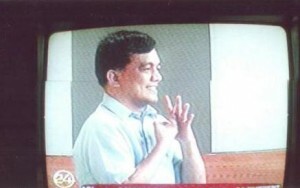 As Training Director of the Manila Christian Computer Institute for the Deaf, he has the interest of deaf Filipinos nationwide, and was obviously the best man for the milestone job. 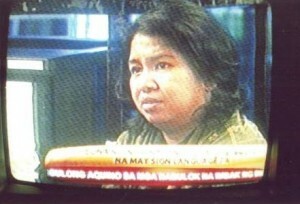 No less than deaf artist/advocate Ms.Myra Medrano also interviewed on the same news, confirmed the impact of the interpreted SONA on her, and on thousands like her, who for the very first time, felt attuned with millions of Filipino viewers. This brings to mind, DOJâ€™s Secretary Leila de Limaâ€™s most applauded line at the Opening of the â€œ32nd National Disability Prevention and Rehabilitation (NDPR) Week last July 17, 2010 in Sky Dome SM City. And we quote â€œ Justice for All would not be possible, without Justice for Persons with Disabilities!â€. In the July 26 SONA, there was indeed a unified feeling of a new hope for every Filipino, when the language barrier was knocked down. NCDA salutes GMA7 and those who pitched in, to make our new Presidentâ€™s SONA a â€œworld hourâ€ for every Filipino, here and in many parts of the world. I am hearing impaired, can speak words sometimes they can’t understands my word.My co-workmates hands me written notes so i understand them what i am going to do.I am focused on lipreading.I have experienced working in mall as salesclerk, and at the Department of Health Center for Health Development in our Region,Region 1, City of San Fernando 2500 La Union last Jan.7,2010 to May 17,2010 and it ends due to lack of funds of the program of DOH-CHD !,and then I am renewed last July 22,2010 until Dec.31,2010.As of now, I am waiting for my renewal of contract…If ever, I haven’t been called, please help me find a good job that suites my disability.I am a mother of 2 children, age 30yrs.old, female and a resident of San Fernando La Union. I really need a job(within my locality) that helps me better for my kid’s schooling and for our daily needs.I have passed the Civil Service Eligibility Sub-Professional Level CAT with a Rating of 81.41% dated April 19,2001.And I am a graduate of Bachelor of Science in Commerce Major in Banking and Finance at Saint Louis College.Please help me for I am looking forward for my possibility in working in any Government Agency within our locality,San Fernando City, La Union. I hope and pray that NCDA will be able to help these persons with disabilities in their search for continued jobs. I, too, am a PWD who was able to work for more than 35 years in different corporations. I am now retired but I, too, still need to work to pay my bills. I hope and pray that NCDA can help us with our needs.